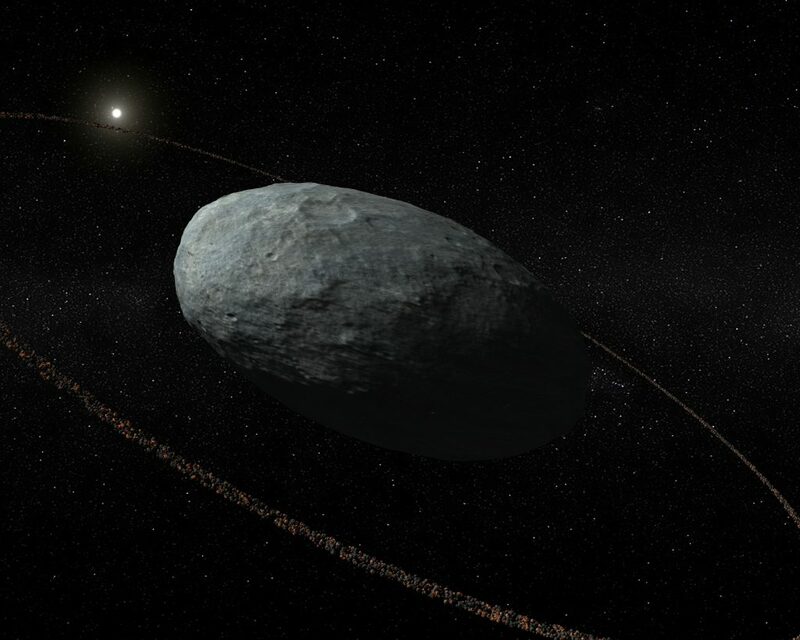 A ring has been found around Haumea, a world more than 2 billion kilometres beyond Pluto. The ring is the most distant ever seen in our solar system. Until recently, the only known rings circled giant planets such as Saturn. In 2013, however, astronomers found two rings around Chariklo, an odd little rock about 250 kilometres across between the orbits of Saturn and Uranus. Chiron, one of Chariklo’s neighbors, may also have a ring. Now astronomers have found a ring beyond Neptune. José-Luis Ortiz and Pablo Santos-Sanz at the Institute of Astrophysics of Andalusia in Granada, Spain, and their colleagues watched Haumea pass in front of a dim red star in the constellation Boötes on 21 January this year. A total of twelve telescopes in six European countries tracked the eclipse. The duration of the eclipse revealed Haumea’s size and shape. But before and after it moved completely in front of the star, a ring around Haumea’s equator blocked some of the starlight. “It was really an amazing surprise,” says Santos-Sanz. The ring is 70 kilometres wide and about 2290 kilometres from Haumea’s centre. “This is fabulous. It’s a really great discovery,” says William McKinnon at Washington University in St. Louis, Missouri. He says that Haumea’s many odd properties may provide clues on how it came to have a ring in the first place. The far-off world is shaped like an egg, which may result from its whirlwind rotation. Haumea completes a full spin every 3 hours and 55 minutes, whereas Pluto, which is almost perfectly round, rotates every 6.4 Earth days. Every 24 hours, a resident on Haumea’s equator would see six sunrises and six sunsets. It also has two small moons. McKinnon suspects that all these traits are linked. He thinks a large object may have hit Haumea, causing it to spin and eject debris that created both the ring and the moons. This impact would also explain another phenomenon: several other bodies travel on almost the same path around the Sun as Haumea and share its composition, having water ice on their surfaces. They could all have been born during the same initial smash-up. Ortiz and Santos-Sanz also found that Haumea is slightly larger than once thought: at its widest, it is nearly the diameter of Pluto, the largest known object orbiting the Sun beyond Neptune. It is, however, only about 1025 kilometres across at its narrowest point, less than half Pluto’s diameter. It is also much less dense than previously thought and has a make-up similar to Pluto’s. Both worlds are mostly rock, surrounded by water ice. And both are shiny, reflecting about half the light that strikes them. Stern says all these interesting properties could make Haumea a good candidate for an exploratory visit from a spacecraft such as NASA’s New Horizons probe, which sped past Pluto in 2015. In fact, New Horizons has just begun its own search for rings around dozens of distant worlds. “What we want to know is, are these rings rare or routine?” says Stern, who is principal investigator for New Horizons. The spacecraft is heading in the wrong direction to study Haumea, but Stern says we could launch a probe its way. “Given the object’s egg shape, two satellites, and ring, it would be a real amazing place to go visit,” he says.